The first thing that people notice when they see you is your smile, and you won’t be able to make a good first impression with dental imperfections like discoloration. Apart from destroying your smile, stained teeth can lower your confidence. It is a concern that troubles many people because it limits how they express themselves for fear of being judged harshly. Fortunately, there are multiple ways you can prevent discoloration. In most cases, daily habits and the food are the cause for discolouration. We’ve put together this guide to explore some things to avoid if you want pearly white teeth and explain safe dental cleaning options for whiter, brighter teeth. Beverages such a coffee, coloured soda, tea, red wine, fruit juice, and sports drinks are all teeth stainers. Red wine, for example, contains chromogens and tannins that trigger tooth discoloration. Certain fruit juices and smoothies made from fruits can also stain teeth depending on the colour of the fruit. Most berries contain staining properties. Likewise, you should avoid using lemonade because it has a high level of citric acid. Drinks such as soda and sports drinks have a very high sugar content, which accelerates the staining process. The high carbonation in soda also increases acidity, which is not good for the teeth either. In most cases, tea and coffee are consumed at hot temperatures. On top of this, these two drinks contain tannins, which are a strong staining agent. If you can’t live without these drinks, try to take them in small quantities. Also, drink water immediately after taking these drinks, and if possible brush your teeth to eliminate remnants. Starchy foods such as pasta, bread, potatoes, and rice have a high level of acid which degrade the quality of the enamel. They are even worse when cooked because cooking raises the acid levels. On top of this, some cereals will also cause plaque buildup because of the high sugar content. The acidity and the bright red colour of ketchup and tomato sauce can also leave a stain on your teeth over time. As mentioned above, berries such as raspberries, cherries, blueberries, blackberries, and pomegranates have strong colours that can stain your teeth. Likewise, popsicles and coloured candy contain strong colourants that can stick to the enamel. Other foods that can trigger tooth discoloration are beets, soy sauce, and snacks. Most health professionals discourage snacking. Exposing yourself to these foods over a long period will not only discolour your teeth but can also lead to cavities. Most people have learned since childhood that brushing is important for overall oral health. While this is true, brushing your teeth too hard can cause more harm than good. Some people tend to approach the task with enthusiasm, going beyond the limits. Teeth may be hard, but hard brushing can destroy the enamel, exposing the softer part of the teeth to the risk of stains. The safest way to whiten your teeth is to consult your dentist, who will recommend the right dental cleaning solution for your teeth. 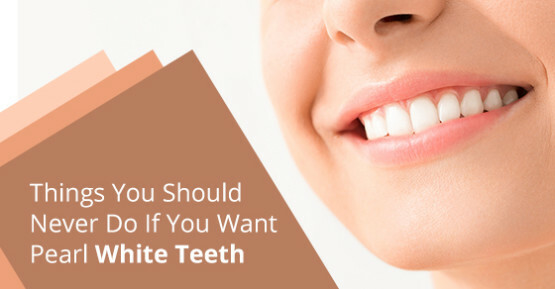 You may also try other short-term solutions such as whitening floss or a floss with texture. Apart from hard brushing, using a toothbrush with bristles can also damage your teeth. Hard bristles will destroy the enamel and causes the gum to recede, which is usually irreversible. With weaker enamel, the teeth are more vulnerable to staining and decay. Reduce this risk by using a toothbrush with soft bristles, and make a habit of brushing your teeth twice a day. If you are an experimental person, you may be inclined to try do-it-yourself whitening solutions. While there are several effective natural whitening options, avoid using lemon or strawberries for a whitening treatment. These products have a high level of acids, which wear away the enamel. In some cases, the acid can cause irreparable damages to your teeth. Some people claim that charcoal is effective in removing stubborn stains, but you shouldn’t experiment with it with your teeth. Some toothpaste with charcoal can be harmful when used incorrectly. In addition to this, some types of toothpaste have harsh additives such as hydrated silica and baking soda. These elements may erode the surface of your teeth, which contribute to further staining. Although most of these products claim they can remove the stain on your teeth, they can be harmful. If it isn’t possible to brush teeth after meals, try to drink water, especially after eating starchy foods and sugary beverages. Moderate flossing, brushing, and constant dental check-ups will keep your teeth white. When you use a straw, the liquid will have less contact with your teeth. On one hand, certain foods can cause tooth discoloration, but on the other hand, there are foods that can help to whiten teeth. These include cheese, milk, fish, flaxseed, and cocoa. Using sugar-free gum can also help to increase saliva flow. If you already have stained teeth, one of our dentists can help put a smile on your face again. For more information about teeth whitening, call Roots on Whyte Dental on 888-602-2308 or contact us here.